"Parents and educational establishments in our community dedicate themselves to educate pure souls and to bring them up and to protect them in holiness and purity, and thank G-d are very successful in this. The safety of our sweet children and protecting them from every harm and abuse is of course necessary. And for that reason, it is our duty to consider every claim of abuse as a very serious thing, and we need to inform how to properly deal with this and to make fences in order to prevent such possibilities and to give proper assistance to everyone who has been abused. The Union has a special committee to deal with cases of abuse amongst our children. The members of the committee are rabbis, educators and members of the community who have been properly trained in how to deal with this. 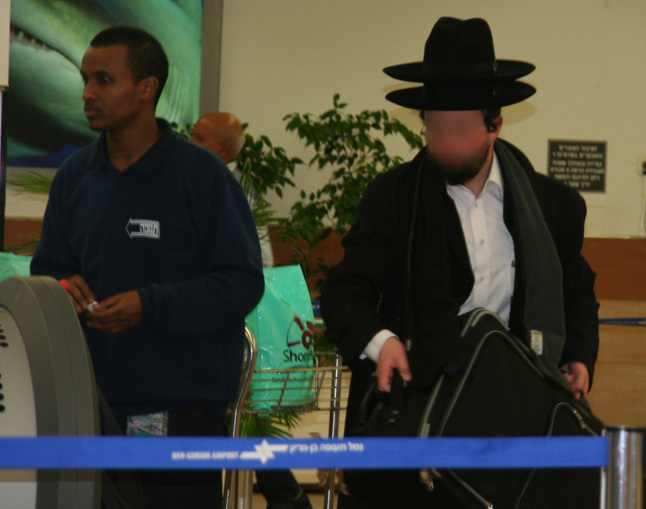 The rabbinate recognises that there are certain times when it is correct and necessary to call the social services and police. The committee will consult with the rabbis to determine the proper course of action in each case. The committee will try to use the advice and help of experts to help families or children who have suffered from abuse. Unfortunately a programme has been made that is about to be broadcast on television about the abuse of children in our community, which claims that even after the actions of abusers are known, they have the possibility of continuing in their acts. 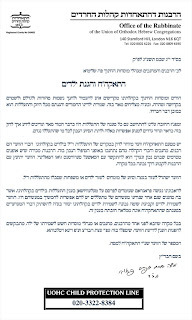 The committee for child protection and determining the correct way to protect our children in our community will help please G-d to silence the claims of the questioners that the Union does not fulfil its obligation in this matter. In every case that comes before one of the rabbis, educators or principals of one of the institutions, where there is fear for a child's safety, you are requested to refer the matter to the committee, which will deal with it in consultation with the beth din and according to the law of the land. The number of the committee is below. Is the internet destroying Christianity? Much has been made of the threat that the internet poses to Charedi Judaism, by providing a forum in which information can flow freely, and anonymously. The web has been a "safe" place for many Charedim to vent frustrations about the way their community functions, express theological doubts, meet like-minded people and access the outside world, all without fear of discovery. 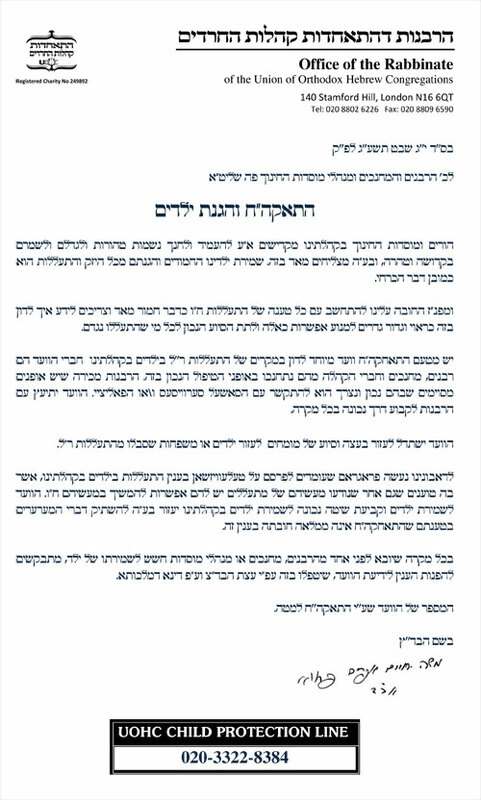 The prime example right now is, of course, If You Tickle Us, a Charedi blog which has helped expose a sexual scandal in London, and allowed thousands of local Charedim to express their anger and disgust at the community's leaders in a way they could not in 'real' life. For Jews who learn that the outside world is threatening and that the secular world has no values, the internet might similarly provide an eye-opener. The essay appears in Rabbi Sacks's 2003 book The Dignity of Difference. I was enjoying watching French player Aravane Rezai give Serena Williams a run for her money in the opening round of Wimbledon (currently in the 3rd set) until I realised that Ms Rezai, born to Iranian parents, was a fan of Mahmoud Ahmadinejad - and even presented him with a pair of tennis rackets because he "has shown Iran's power to the entire world" and she is "really proud of him". See an interview with her here. It's a shame she didn't expose him - presumably for legal reasons. But if he was silly enough to say something like that to a journalist once, hopefully he will do it again -- under circumstances in which he can be named. OK, I'm back. Sorry for the longer-than-planned absence. Due to a family simchah, I'm going to be offline all of this week - back around January 17th or 18th. See you back here then!